Disclosure:: I was sent a review copy from the vendor in exchange for an honest review. All views shared are mine and mine alone. My girls first saw this short movie on Amazon through our free streaming Prime service. They were fans of the book, and were excited when they saw a movie was made based on this popular children's book. And, once they watched it, it became an instant hit with them. I lost count on how many times they watched this. But, didn't forget them asking if it was available on DVD, as they wanted to get and watch in the car on way to classes and long drives. So, when I heard it was releasing and was available cheap, only $6.39, I had to get my hands on a copy. But, before I could order, I was sent a copy to feature on my blog. I wish you could have saw my girls' faces when they saw the DVD arrive at our door a couple weeks ago. 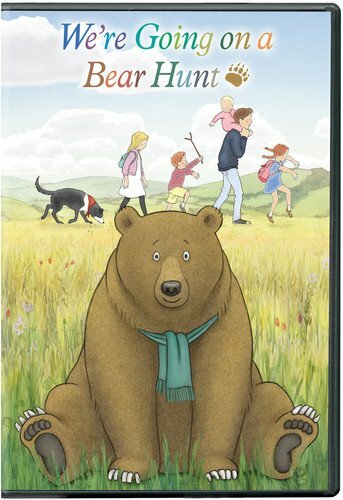 In addition to the short film, about 25 minutes in length, the DVD also includes some fun special features -- three featurette segments: "Painting the Bear Hunt" and "We're Going on a Bear Hunt, the Making of." I love watching bonus content that is included on DVD releases, and enjoyed watching this bonus content with the girls. They loved learning how the book came to life in this cute movie, and loved comparing the book which they loved reading, still to this day, to the movie. My girls really enjoyed this movie back when they watched it for the first time on Amazon Prime, and now get to watch it whenever they want, thanks to it now available to own on DVD. If you have a child who loves this short movie, or is a fan of the book, then this DVD would make for a great stocking stuffer this holiday season. "Based on the best-selling bedtime story book written by Michael Rosen and illustrated by Helen Oxenbury, the film follows siblings Stan, Katie, Rosie, Max, the baby, and Rufus the dog, who decide one day to go on an adventure through whirling snowstorms, oozing mud, and dark forests in search of bears! Featuring the voices of Olivia Colman (The Night Manager, Broadchurch), Pam Ferris (Matilda, Call The Midwife), and Mark Williams (Harry Potter), this animated story is filled with stunning visuals sure to enchant viewers along with its story of perseverance, optimism, and love of nature. “WE’RE GOING ON A BEAR HUNT” has a run time of approximately 25 minutes."